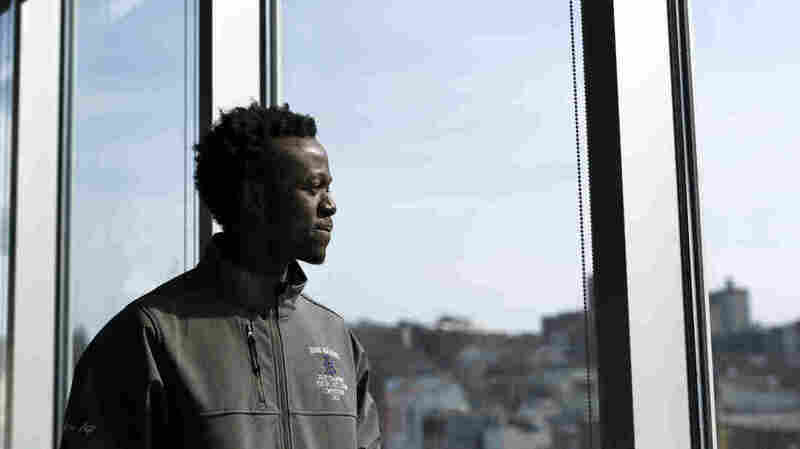 Asylum-Seeking Student Says Nothing Can Stand Between Him And Poetry Allan Monga of Portland, Maine recently won the right to compete in the national Poetry Out Loud festival. He was initially barred because he's an asylum seeker and not a U.S. citizen. Allan Monga, a Deering High School junior, won Poetry Out Loud contests at school and at the state level. He was initially denied entry to the national competition because he's an asylum seeker and not a U.S. citizen. Poetry Out Loud's official rules require permanent residence, so Monga filed a lawsuit against the National Endowment for the Arts and the Poetry Foundation. A judge granted a motion allowing him to compete, and he went on to represent the state of Maine in the competition. He read two poems but did not advance to the finals. Monga says fighting to compete in Poetry Out Loud was important to him — and others. "I am not the only kid who's an immigrant, like the Portland public schools [themselves] have a huge body of kids from all over the world who are definitely in my situation," Monga says. "So, I wanted to create a way that kind of opened the door for everyone." Poetry is like a whole new world to me. Back in my country, I did not have anything about poetry, but poetry is something that I got to learn once I got here. You know, I did research. It's just something like — I developed feelings for it. It's like I'm in a relationship with poetry. Ms. Callaghan. I mean, I was just sitting one of the days in our class, and she was like, "Do you wanna try this?" I was like, "Um, maybe, nah." But I did [some] research, and it was just like magic. It happened, and I will tell you, it is addictive. Your feelings, or passion for it, grows everyday. And honestly, I will not let anyone stand in between the relationship I have, I've grown for poetry. It talks about the good and the bad of America. And me, as an immigrant, I can come across a challenge. Example: what's going on right now with the NEA trying to say I cannot compete. To me, I consider it as a challenge. But the good? They said I can compete. I had people, the entire Portland public schools, everyone has just gone above and beyond to make sure that I'm here today. And I don't know, that poem to me is just like music to my ears. Matt Ozug and Bridget Kelley produced and edited the audio story. Sydnee Monday and Petra Mayer adapted it for the Web.